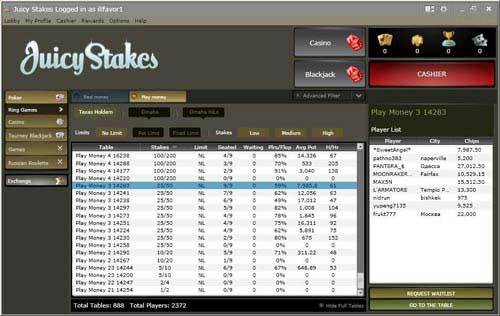 Juicy Stakes Poker has quickly risen among the ranks to become one of the most exciting and lucrative opportunities in internet poker today. They surely live up to their namesake by offering a number of games full of weak opponents and player-friendly promotions. Juicy Stakes offers a large number of freerolls and tournaments of all types. The range of sit-n-goes available is quite large, with tournaments for just over a half dollar. Players can also play in satellite tournaments for larger events. They offer the typical options of Hold’em, Omaha and other more unique varieties for players with varied tastes. 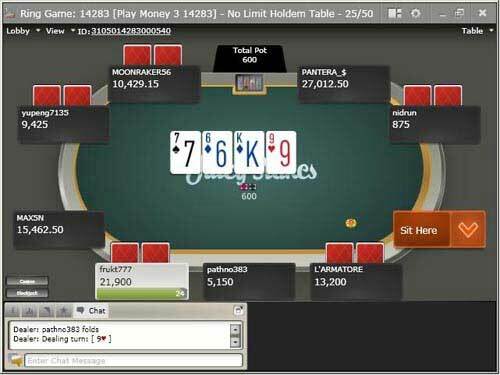 The site has relatively low traffic, mostly at lower stakes tables, but players should have little difficult finding a great table or two. The rewards system at Juicy Stakes is where the site really shines. Along with offering massive deposit bonuses, they have a loyalty program that rewards players for consistent, long term play. Their Gold Cards are awarded randomly to real money players, who can use them to enter exclusive tournaments or trade them to other players. The Juicy Stakes Gold Chips are for those who play real money ring games and tournaments with regularity. They are used to enter special tournaments. Most importantly, they offer Loyalty Levels, which are instant reward cash and other bonuses for frequent play. The interface on Juicy Stakes is good enough to service the needs of every player. Players should have no difficult navigating the field of games at their disposal. The Revolution Network generally has very good software, and Juicy Stakes is no different. The table layout is simple yet attractive, with options for pretty much anything your could want. Players can use interactive avatars to represent themselves realistically based on different game states, or to go with the simple background devoid of the extra flair. The tables themselves feature many standard components, such as action buttons to facilitate player speed. The buttons on juicy stakes tend to be color-coded, making quick actions very easy and player-friendly. Players have a few options as well for their betting increments. In-game play is commendable, with many options available including chat windows and customizable table sizing and backgrounds. Play is very fast, and players can sort games by stakes, type and limit in the lobby. For the sake of security and anonymity, player ID’s can be changed once a week. One of the perks of playing on a relatively small network is the ease which which a player can find really good games. Juicy Stakes really lives up to its namesake, with soft competition and player-friendly opportunities all over. Most of the best games will be at the lower stakes poker tables and tournaments, so be sure to take a swing there. Player traffic at Juicy Stakes isn’t tremendous, but skilled competitors can easily use that to their advantage and seek out the best games with ease. The website is still growing quickly, thanks to attractive gameplay and rewards. The boom days of easy money are over for internet poker, but there is still ample opportunity to take advantage of many weak players at Juicy Stakes. The fish rating is very high, and with a little bit of practice, combined with the ability to change player IDs, a skilled player should have their way on Juicy Stakes. Juicy Stakes really excels at rewarding its players, both new and old. All first time deposits are qualified for a 200% deposit bonus, up to a whopping $2,000! by using the Juicy Stakes Poker bonus code 1000JUICY after making their deposit. All bonuses are cleared in $5 portions by earning Frequent Player Points (FPPs) on real money tables. Pending bonus funds expire after 90 days, and a player may not earn two bonuses at once although he or she may stack up bonuses to clear consecutively. On top of the bonus, you will receive 36% rakeback for life at Juicy Stakes! Just use our links to qualify! Rakeback players clear bonuses only half as quickly as non-rakeback players, but the total of rakeback + bonus is better by using our links that if you had just the bonus without any rakeback. Other promotions include the $500 New Depositor Freeroll and over $7 million in monthly guarantees along with satellites into live tournaments. There are frequent reload bonuses and rake races to give you back even more value. In the Juicy Stakes Loyalty program, you’ll be rewarded for regular play. There are 50 levels, and each one grants you a specific prize once you reach an FPP target. If you can reach the target within certain timeframes, the reward is even higher. At the highest tiers of this Loyalty Levels program, dedicated grinders can achieve cash back rates over 20%. All new accounts signing up at Juicy Stakes will receive 36% rakeback on all rake paid. Every Wednesday, you will receive a payment for the previous week’s rake. Example 1: You play 300 $30+$3 SNGs meaning you paid a total of $900 in rake. On the following Wednesday, you will receive 36% back, or $324. Example 2: You play 50,000 hands of 25 NL cash and pay a total of $1,500 in rake. You would receive $540, or 36%, back. Juicy Stakes offers 24/7 support via e-mail for all of its members. They have a goal of answering e-mails within 2 ours of receipt, and have a generally favorable track record. It is unfortunate that live support is not available at this time, but quick e-mail responses coupled with a decent FAQ page means that most player difficulties should be resolved in short order.